March 14 is Pi Day. You know what pi is, right? It's the ratio of the circumference of a circle to its diameter. So why is March 14 designated as Pi Day? Because March 14 is 3/14 and Pi is 3.14! It doesn't seem like much of a holiday to celebrate - unless you love math, and we know that mathematically gifted kids do! 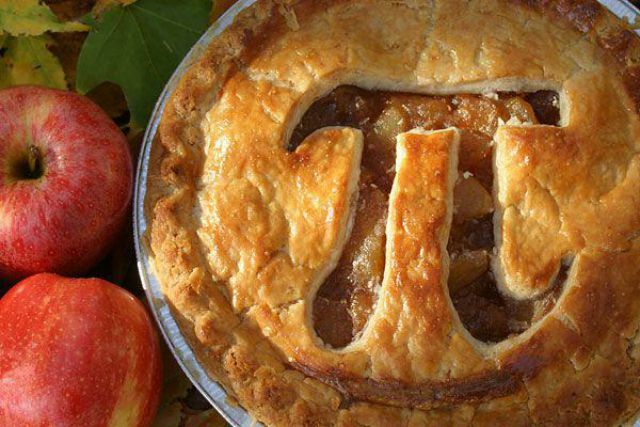 Here are some fun ways to them and the whole family to pay tribute to pi. Learning about pi is a good way to pay tribute to that fascinating number. As you can imagine, there aren't too many children's books on the subject, but there are a few. Some provide interesting facts about pi and some provide some fun practice with pi. One even presents a fantasy story involving pi and a dragon. The fantasy story is for kids as young as seven, even younger if you have an early reader or would like to read the book to your child, but even older kids (and adults) will enjoy the story. Another book is for teens and adults, but some younger kids might like it too if they really like learning about numbers. This one is really slick! Until you cut it, it looks like a regular, fancy cream pie. But when you cut it, pi is revealed in the pie! The symbol for pi is visible inside every piece. This pie isn't pie-shaped; it's pi-shaped! You have to be a little creative with this one as it requires that you create a pi-shaped "pan" out of tin foil. But you don't have to bake it and it looks (and tastes) great! If you're not ready to bake some pies, consider baking cookies instead. As with pies, you have several options to choose from to create pi cookies. If you have the time and are feeling especially creative, you can make cut-out cookies in the shape of the pi symbol. Unless you are fortunate enough to have a pi-shaped cookie cutter, such as the one available from Copper Gifts, you'll have to cut the shapes out by hand. If you want to stick with cut-out cookies, but don't have a pi-shaped cookie cutter, consider making number-shaped cookies - 3's, 1's, and 4's. Those cutters are usually readily available wherever baking supplies are sold since they are so often used for birthdays. Don't worry if your only cookie cutter is round (you can use a biscuit cutter or even a glass). You can make round cookies and then decorate them with icing. Just put 3.14 on each cookie or the pi symbol. You really don't even need cut-out cookies. Sugar cookies will work, too. In fact, any cookie, even drop cookies, will work just fine as long as the surface is flat enough to decorate. Is your child artistic? How about creating some pi greeting cards? It IS a holiday, after all. All you need is some paper and your child's favorite art supplies: crayons, paints, colored pencils, glue, glitter -- whatever your child enjoys working with. If your child doesn't know anyone who would appreciate a Happy Pi Day card, which I know is hard to imagine, then make Pi Day card creation a family affair. Spend the evening with everyone in the family making a card for everyone else. If the family isn't fond of art projects, don't worry. You can still send cards to people - electronically. The 123 Greetings Web site has a wide variety of Pi Day e-cards to choose from. This is violin music that converts pi digits to notes. There's a link to sheet music for it. Singing pi. Really. Singing a minute's worth of pi digits! The numbers appear on the screen in an interesting and colorful way, too. Lyrics about Pi set to the tune of "Bye, Bye, Miss American Pie." It's quite amusing. The lyrics appear on the page so you won't miss any of them. So there you are! Lots of fun things to do on Pi Day!